The Avenue des Champs Elysees runs westward from the Place de la Concorde to the Arc de Triomphe. Looking west from Place de la Concorde, one can easily see the Arc de Triomphe, 2.2 kilometers away. On a fairly clear day, from the same vantage point, one can see beyond and through the Arc de Triomphe to the Grand Arche de la Défense, 6 kilometers in the distance. Champs Elysees translates as "Elysian Fields", which in Greek mythology is the Kingdom of the Dead and seen by Greeks to be a lovely resting place for the souls of heroes and other worthy people. Before the 17th century, the area of the Avenue des Champs Elysees was fields and vegetable gardens and outside of City walls. The first development was in 1628 when Marie de Medici created the Cours de la Reine, a tree-lined, mile long promenade along the bank of the Seine river. In 1670, Pierre le Notre developed another promenade, the Grand Cours, extending westward from the Palais des Tuileries. This was done in hopes of persuading King Louis XIV to remain in Paris and not move to Versailles. It didn't work. During the early 1700s, the marquis de Marigny extended the Grand Cours of Le Notre's from where it ended, at the now Rond Point des Champs Elysees, to the top of the hill Chaillot where the Arc de Triomphe now sits. By 1724, this avenue of trees and promenade had developed into a street with a length of what it is today, 2.2 kilometers, and was becoming a fashionable walking lane. 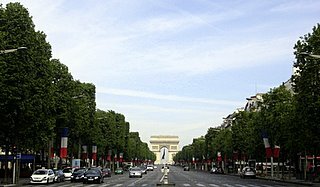 In 1828, the Champs Elysees became city property. Footpaths, fountains and gas lights were installed which brought along the development of cafés, restaurants and theatres. 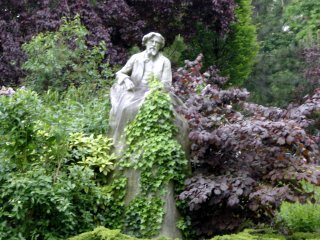 In 1858, Alphand developed the Jardins des Champs Elysees into an English-styled garden with large lawns and rare trees. The Avenue has been progressively developed and embellished over the years, most recently in 1993 when the sidewalks were widened. From Place de la Concorde, head westward, towards the Arc de Triomphe, and you'll be walking on the Avenue des Champs Elysees, the most famous street in Paris. On both corners, marking the beginning of this avenue since 1789, vaulted on high pedestals designed by David, are sculptures called the "Marly Horses", created by Guillaume Cousteau in 1745, commissioned by Louis XIV. These, however, are replicas. The originals are in the Louvre Museum. By staying on the right (north) side of the street and you'll find a wide, tree-shaded sidewalk. Along this sidewalk you'll find crowds of tourists and booths selling crêpes and cold drinks. You can, however, branch further off to the right and walk among the trees and the flowers in the Garden of the Champs Elysees. It's a recommended move. You won't lose any time and you'll gain quality time, along with finding lots of benches for enjoying all the statues, the fountains and the flowers of the Garden. Among the trees you'll encounter will be a Giant Sequoia, firs, yews and Japanese Sophora. There are also several "memorial" trees planted, such as the cedar planted by Mayor Tiberi in February, 1996, to the memory of the fallen Prime Minister of Israel, Yitzak Rabin. You'll see the Giant Sequoia just after turning off of the sidewalk. Just beyond it is the Espace Pierre Chardin, home of the Avant-Garde during the 1970s. This stylish building doubles as a restaurant and a theatre. 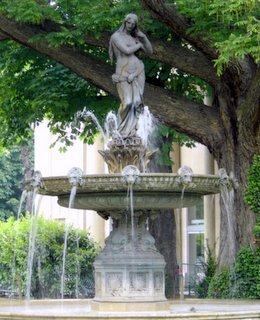 There is a lovely fountain featuring the statue of a tall, elegant woman washing her hair situated between the Espace Pierre Cardin and its neighbor, the Pavillion Gabriel, which is used for television programming. Opposite the Pavillion Gabriel, towards the Avenue, is a public restroom. Further down from the Pavallion Gabriel is the Pavillon Elysée, built for the World Exhibition of 1900, a world renown restaurant and tea room. 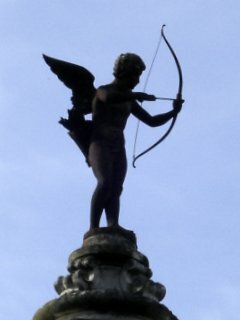 It's a lovely building with a statue of Cupid on top. Behind the Pavillon Elysée and across the Avenue Gabriel are the backyard gardens of the Embassies of the United States and the United Kingdom. Their entrances are located on rue Faubourg St. Honoré. Due to the wall-like fence and covering foliage, these buildings are almost impossible to see. A little further down is the garden of the Palais de l'Elysée, the residence of the French President. The garden is distinguished by a tall, ornate wrought-iron gate. A few steps westward and you will arrive at Avenue Marigny. Across this avenue is the Théâtre Marigny, designed by Charles Garnier, the architect of the Opera Garnier. This is one of the better known theatres in Paris, billing top-name artists. 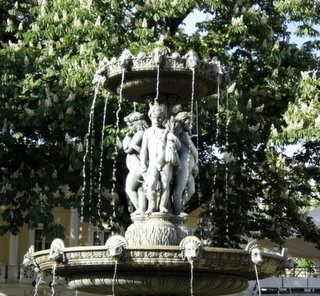 Next to the theatre is a fountain of four cherubs representing the four seasons. Opposite this fountain is a small children's playground. Then, the Pavillon Laurent, an elegant restaurant. On Thursday, Saturday and Sunday, behind this pavilion, on the sidewalk of Avenue Gabriel, is the stamp market, where old and unusual stamps are sold. Just beyond the Pavillon Laurent is a carousel that opens daily at 2:30 p.m.
Next to the carousel is the Théâtre Vrai Guignols, the oldest puppet theatre in Paris. This small, outdoor theatre was established in 1818. At 3:00 p.m. on Wednesdays, Saturdays, Sundays and holidays the little spectator benches are filled with children and adults enjoying theatre in one of its oldest forms. For further information try www.theatreguignol.fr or theatreguignol@wanado.fr. We have now reached Rond Point des Champs Elysees, a traffic circle, which deserves a look. Normally, there will be a stunning floral display on each of the four major points of this round-about. If there isn't something wonderful to look at, come back the next day. A well-groomed grassy area could change into a tropical paradise over-night. The Rond-Point divides the Champs Elysees into two distinct halves. The eastern half, which you just walked through, is gardens and theatres. The western half is all business. From the Rond Point to the Arc de Triomphe, the Avenue des Champs Elysees is lined with clothing stores, restaurants, fast-food places, cafés, money exchange booths, department stores, Virgin Records, Disney Store, movie theatres and car show-rooms. At the top of the Champs Elysees (you will notice the incline of the small hill Chaillot) is theArc de Triomphe. Walking back on the south side of the Champs Elysees, which will now be slightly downhill, you will pass even more cafés, shops and restaurants, including Le Fouquet's, established in 1901, where celebrities are regular diners. Once again, you will arrive at Rond Point des Champs-Elysées. Branching off from Rond Point to the right (south) is Avenue Montaigne which features such shops as Gucci, Prado and other high-end boutiques. Once you've crossed Rond Point you will see the Théâtre Rond Point, built in the shape of a rotunda. It was formerly the Palais des Glaces, Palace of Mirrors. It was designed by Davioud and inaugurated in 1860. It also has a theatrical library. Continuing on brings you to Avenue Franklin D. Roosevelt. By walking south (to the right) on this avenue you will come to the main entrance of the Palais de la Découverte where, on both sides of the door, are large bronze horses. The Palais de la Découverte is an interactive science museum, complete with a planetarium. 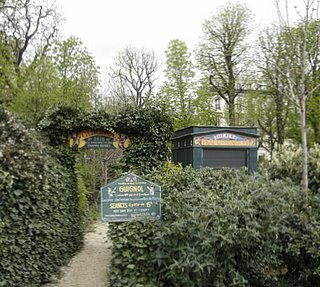 Further down this avenue, toward the Seine and the Invalides bridge, you will come to an enchanting little grotto which has a small water-fall and pond. Walking through here will bring you to Avenue Winston Churchill where on the corner is a bronze statue of Churchill. Here, also, is a fine view of the ornate Alexander III bridge and, across the river, the Eglise du Dôme, which houses Napoleon's tomb. Taking a left on Avenue Winston Churchill will bring you up to the main entrance of the Grand Palais. 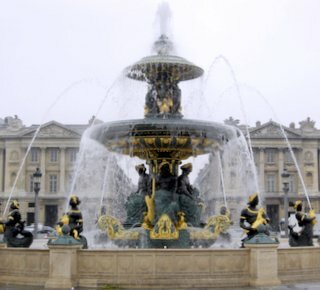 The Grand Palais holds temporary art and cultural exhibits. 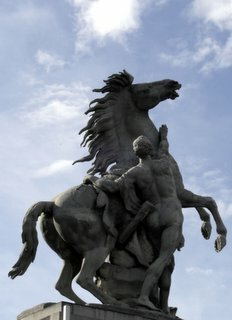 It is marked by the now-turned-green bronze sculptures of horses and chariots on two of its rooftop corners, along with many sculptures in bas-relief along its walls. It also is distinguished by its enormous glass roof which has recently been renovated. Across Avenue Winston Churchill is the Petit Palais, the Musée des Beaux Arts de la Ville de Paris, the Museum of Fine Arts of the City of Paris. It has recently undergone a 4 year renovation and is quite a stunning building. Admission to its permanent collection is free. 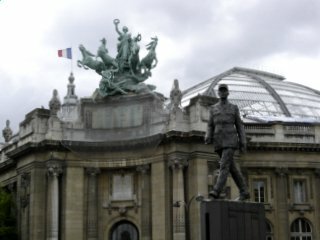 You have now arrived at Place Clemenceau where you'll find the Metrostation Champs-Elysées-Clémenceau on metro lines #1 and #13, as well as a statue of General Charles de Gaulle, positioned as if he, too, is strolling down the Champs Elysees. The pavilion just east of the Petit Palais is the Ledoyen. It is primarily used for private parties. It is very easy to enjoy the festive ambience if you happen to be passing by while a "soirée" is going on. From here it's just a few steps through the park back to the Place de la Concorde and the Obelisk of Luxor and its fountains. In the far north-east corner of the Place is the entrance to the Concorde metro station, lines #1, #8 and #12. Directly east of the Obelisk is the gated entrance to the Tuileries Garden, one of the largest and most historical parks in Paris.